This post is part of the F# Advent Calendar in English 2017 series organized by Sergey Tihon. 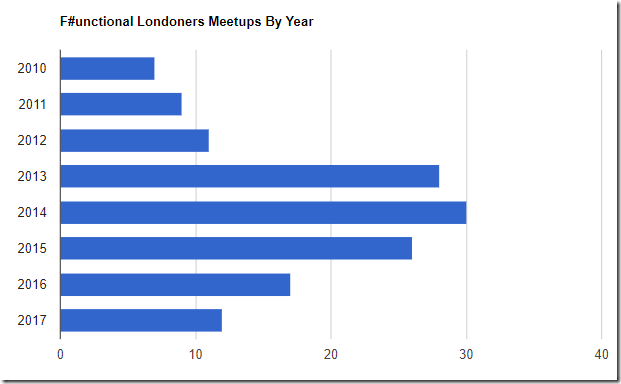 For this post I thought it would be fun to use the same Meetup API to focus in on the activity of the F#unctional Londoners Meetup group with an F# script. 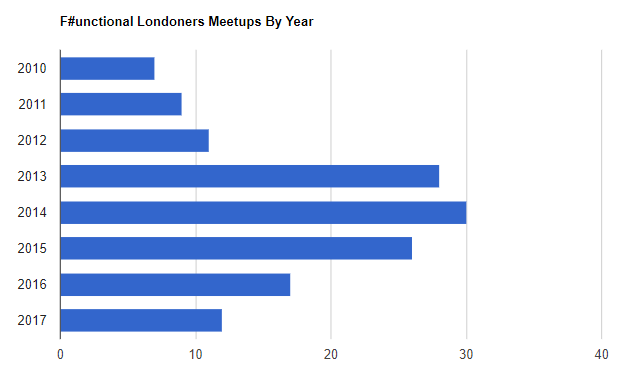 let years = eventsbyYear |> Chart.Bar |> Chart.WithTitle "F#unctional Londoners Meetups"
Looking at the data, we can see there’s been a meetup almost every month since the group started back in 2010, and back in April 2016 we managed 5 events in just one month! 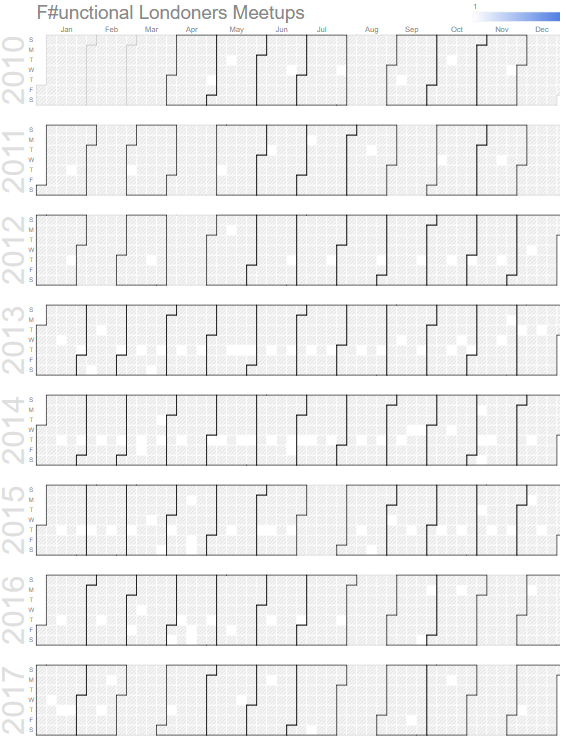 We can also see that there’s been slightly less meetups over the last year and a half. This roughly coincides with the fact that I stopped working in London in early 2016. To this end, if somebody who is interested in F# AND lives or works in London would like to get involved in organizing the group, then please do get in touch. That said the show will still go on (just a little less frequently), and we have a meetup scheduled this week on Thursday 7th December with Jorge Gueorguiev Garcia on Functional Calisthenics, so please do register and come along. This post is part of the F# Advent Calendar in English 2016 series organized by Sergey Tihon. 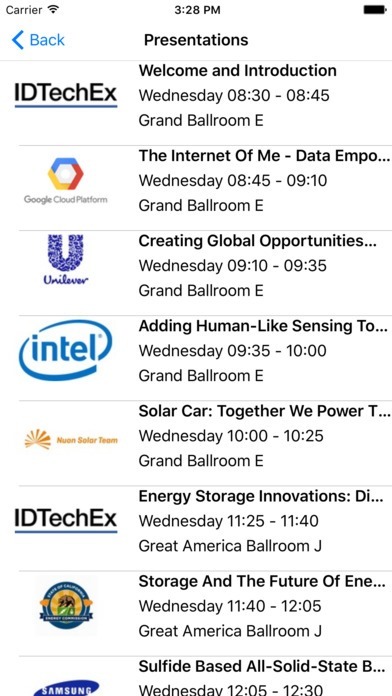 Last month on November 16 – 17, IDTechEx held their largest annual conference and tradeshow on emerging technologies in California with over 200 speakers and close to 4,000 attendees. 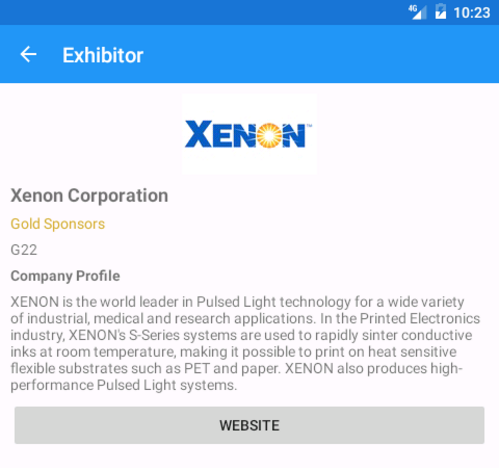 The show covers a wide variety of topics including electric vehicles, energy harvesting, energy storage, IoT, graphene, printed electronics, robotics, sensors, AR, VR and wearables. 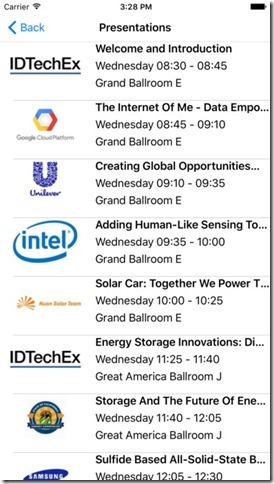 Coming from a software background, I couldn’t help but marvel at the size of the event and the level of genuine innovation and entrepreneurship on show. If you’re based in Europe I’d highly recommend attending the Berlin event in May 2017. This post will talk about some of the development process and some of the design decisions for this app. IDTechEx wanted a native business app that targeted the vast majority of mobile users which concretely meant iOS and Android support. Xamarin.Forms was chosen as it allows business style apps to be built for both iOS and Android where most of the code can be shared. It is hoped that over the life of the product that the use of Xamarin.Forms should help reduce maintenance costs and improve time-to-market. Xamarin’s ecosystem, including Xamarin.Forms, supports both the C# and F# programming languages. F# is a pragmatic, low ceremony, code-oriented programming language, and the preferred language choice for IDTechEx and it’s development staff. Switching between Xamarin Studio and Visual Studio on the respective operating systems was seamless. Initially I built a couple of very simple prototype apps using only a a subset of the data, one using XAML and data binding and another using just code. After some playing I came down on the side of the code only approach. Xamarin.Forms is quite close to WPF, Silverlight and Windows Store application development. I built a working skeleton/prototype as an F# script using WPF and the F# REPL which gives incredibly fast feedback during development. Once the flow and views of the application were better defined, and I’d received early feedback from users, I threw away the prototype and rebuilt the app fully in Xamarin.Forms. Note: the plan to throw one away referenced in this section heading refers to Fred Brooks Jr’s suggestion in his seminal book The Mythical Man Month. 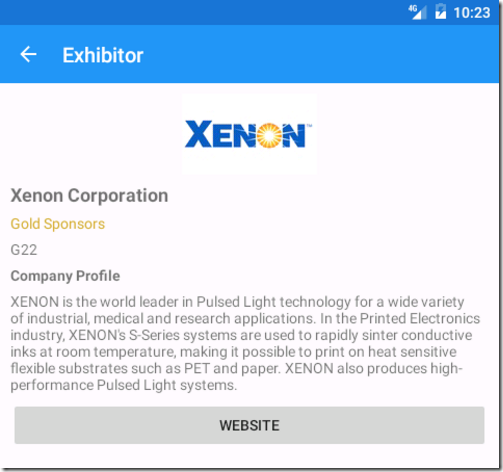 For lists of items, for example exhibitors or presentations, I used Xamarin.Form’s built-in ListView control and the ImageCell and TextCell, along with a custom cell providing more subheadings. For image loading I used the excellent FFImageLoading which can cache image files on the user’s device. Using Xamarin.Forms and F# allowed be to successfully build and publish a cross platform mobile app targeting iOS and Android in a short time frame. F# allowed fast prototyping and quick feedback while building the app. Xamarin.Forms worked well and meant that almost all of the code was shared between the platforms. I’d whole heartedly recommend this approach for similar business applications and we plan to extend the app heavily in future releases. Silverlight, once hailed by Microsoft evangelists, is now dead, crucified by the side of Flash by Jobs when he brought down his tablets from mountain view, and then buried by Sinofsky under his surfaces. But is it really dead? Silverlight certainly seems dead in the browser with Google cutting off support in Chrome followed by Microsoft in Edge. Yet Silverlight still lives on in Windows Phone and Windows Store (formerly Windows Runtime, formerly Metro). 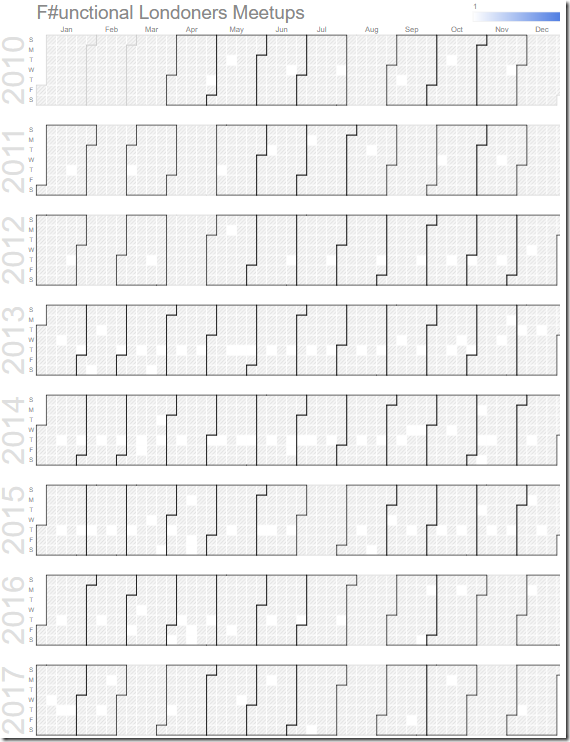 Back in 2010 and 2011 I made a series of mini games written in F# with Silverlight and hosted on this blog along with some online arcade sites likes GameJolt and SilverArcade. Rather than let them slide into the sands of time never to be played again I thought I’d have a go at resurrecting them for Windows Phone. I started by attempting to create a Windows Phone project in my shiny new installation of Visual Studio 2015 Community, but failed at the first hurdle. To run the Windows Phone emulator you need the Professional version of Windows and silly old me had installed the Standard edition when I rebuilt my Windows partition after a fatal blue screen in the new year. Then I moved on and tried trusty Visual Studio 2013 but hit the same hurdle. Not to be deterred I went back another year to Visual Studio 2012 but hit a new obstacle, where the 2012 tools don’t work if you have 2013 installed. No problem, I span up a virtual machine in Oracle’s Virtual Box with ye old faithful Windows 7 and Visual Studio 2010 installed, and after pushing on VS2010 SP1 and the Windows Phone tools, then some obligatory rebooting and service patches, I was up and running and had a game ported and playing on the emulator. I used a Windows Phone project template from Dan Mohl, which requires an empty C# host project because CLR stands for Common C# Language Runtime apparently. My only remaining issue was that running the phone emulator within a VM was painful. My next step was to purchase dedicated hardware in the form of a refurbished Thinkpad (circa 2010) from Morgan Computers and I finally had a stable environment with an emulator for porting the apps and games over (although no option to deploy to a device as the Zune software is no longer supported). Microsoft are currently touting the Universal Windows Platform as the future, letting you easily deploy your apps between Windows 10 Phone, Store and other platforms. That said with Visual Studio 2010 I can target the entire Windows Phone range from 7 up to 10, note that number 9 went missing somewhere along the way. 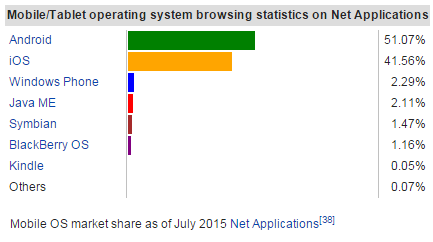 Also note the Windows Phone 7 market currently appears to be almost as “large” as Windows 10 Mobile. The first game I ported over was Invadurz, a homage to a classic 80s arcade game. It’s available in the Windows Store and I’ve recently upgraded it with low-latency sound effect support via XNA. and won an Easter Egg from Tesco for my efforts! Just as in the bible, a second coming is in the offing. XNA is dead, long live MonoGame. and many more users, or at least that’s the theory.